We’d love your help. Let us know what’s wrong with this preview of The Lady Raven by Rebecca Henry. To ask other readers questions about The Lady Raven, please sign up. In The Lady Raven, Rebecca Henry tells the tale of Zezolla, a little princess abandoned by her father into the hands of her evil stepmother and wicked stepsisters. A familiar fairy tale you may think but all is not as it appears. The reader is I received a free copy of this book in exchange for a fair and honest review. All opinions are my own. I liked this retelling of cinderella story, i enjoyed every word, every dailogue, every page of it . Zezolla is treated with cruelty, neglected, and left to serve in her own castle. The only friends she has are her beloved raven and her pet wolf. i liked that i didn't feel like reading a cinderella story,but more in a royal univers.Though it clear I liked this retelling of cinderella story, i enjoyed every word, every dailogue, every page of it . i liked that i didn't feel like reading a cinderella story,but more in a royal univers.Though it clearly showed us how society was hard on women and considered her more like obejects to own than a person to share life with. while reading, i technically fell with the raven loyalty,i kind of knew how he will end up..
all of this would be borring if there is no magical fantasy elements that made my reading verry light. i loved the fact that the author ,sort of , highlighted, if i might say, the " always do what you mom tells you to do" indirectly , because it is always right. i recommend everyone who likes dark retelling , with some wichecraft, to read this book. I found this to be an engaging read, having a strong knowledge of several re-tellings, this one completely stands out. The story is very easy to follow while still drawing the reader in.You HAVE to know what is coming next!! The Lady Raven is not your everyday telling of Cinderella. There are aspects that will indeed come through, however this tale... is more of the darker side of the story. 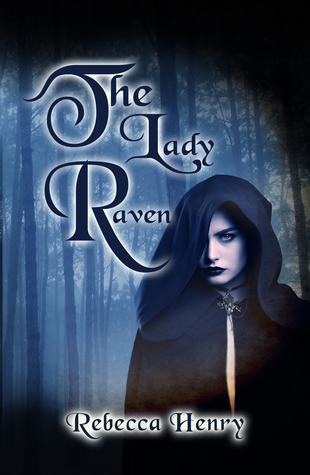 The Lady Raven is a Cinderella retelling, but with a twist. It follows the basic storyline, but the story is so much more. Full of betrayal, murder, and magic. it's the story of Zezolla, who despite everything that happens to her, stays good. After her mother is murdered, her father remarries. But the marriage is short lived. Not long after he gets marries again, by her governess who Zezolla trusted, but is not who she seems. Life gets even more difficult for her. She gets stripped of all her belongings, her title and left to live as the servant. Her only friends are her raven and wolf. But she doesn't give up, she stays kind and good. The start of the story is a bit slow, but the pace picks up and gets a lot better. The book is full of twists and turns and there is no dull moment. It's also very dark, there is a lot of gruesome deaths, beating, severed toes and lots of magic. :) And I love reading it! I struggled a little deciding how to rate The Lady Raven. On the plus side, this is an interesting, dark retelling of the familiar Cinderella story. I liked many of Henry's changes and additions, and the pacing of the piece worked okay. What let this book down, though, was the prose. It needed a thorough edit, as there were constant instances of incorrect punctuation, repetition, and stilted dialogue. They were on every page, making them impossible to ignore, and it was therefore hard to sink in I struggled a little deciding how to rate The Lady Raven. On the plus side, this is an interesting, dark retelling of the familiar Cinderella story. I liked many of Henry's changes and additions, and the pacing of the piece worked okay. What let this book down, though, was the prose. It needed a thorough edit, as there were constant instances of incorrect punctuation, repetition, and stilted dialogue. They were on every page, making them impossible to ignore, and it was therefore hard to sink into the story. Since turning the final page, I have been prevaricating between two and three stars on the rating side of things. However, I've recently given three-star ratings to other books that contained far fewer errors. Therefore, I think I will have to clock this one in at a 2.5. There are some excellent qualities in terms of the story idea, but I just can't overlook the problems with the prose. If you can, and if you love fairytale adaptations, then maybe give it a try. Rebecca Henry is a newly published author. Her debut novel is The Lady Raven, A Dark Cinderella Tale, which was published in 2017. The Lady Raven, is for those who have an infinity for fairy tales retold with a link to witches, magic and the macabre. Her second novel, Louisiana Latte, a chick lit comedy was released February 28th 2019. Louisiana Latte, is a feel good comedy that focuses on the bon Rebecca Henry is a newly published author. Her debut novel is The Lady Raven, A Dark Cinderella Tale, which was published in 2017. The Lady Raven, is for those who have an infinity for fairy tales retold with a link to witches, magic and the macabre. Her second novel, Louisiana Latte, a chick lit comedy was released February 28th 2019. Louisiana Latte, is a feel good comedy that focuses on the bonds of sisters, and how audacious life can be when you have a diva for one! Both books are available on amazon as well as Barnes & Noble. Rebecca Henry is a world traveler living abroad in England. Besides being an author of two published books, Rebecca is also a podcast talk host on the show The Latte Talk. The podcast was inspired by her latest novel, Louisiana Latte and her diva sister Deb. She is a serious vegan, gardener, crafter, wife and mom who practices yoga. She loves to laugh, her drug of choice and loves all things witchy with a hint of the macabre. Her favorite holiday is Halloween and her favorite movie of all time is Practical Magic.